NBC/WSJ/Marist polls: Obama leads in Iowa, running neck and neck in N.H, Wis.
Less than a week before Election Day, President Barack Obama holds a statistically significant lead over Republican nominee Mitt Romney in the battleground of Iowa, while the two candidates are locked in tight races in New Hampshire and Wisconsin, according to new NBC News/Wall Street Journal/Marist polls. In Iowa, Obama is ahead by six points among likely voters, 50 percent to 44 percent, which is down from his eight-point lead earlier this month. In Wisconsin, the president edges Romney by three points, 49 percent to 46 percent, which is within the survey’s margin of error. That’s also down from Obama’s six-point lead earlier this month. And in New Hampshire, Obama gets support from 49 percent of likely voters, while Romney gets 47 percent. In September, before the debates began, Obama held a seven-point advantage in the state, 51 percent to 44 percent. As the storm cleanup begins, the Republican presidential candidate is facing questions about his position on the federal government's role in disaster relief. NBC's Peter Alexander reports. “To be at 49 or 50 [percent] is a good number this close to Election Day,” Lee Miringoff, the director of the Marist College Institute for Public Opinion, says of the president. The surveys were conducted Oct. 28-29 – almost all of the interviews were conducted before Hurricane Sandy hit the East Coast, including New Hampshire – and they show a gender gap that’s benefitting Obama. In all three states, he enjoys a double-digit lead among women (by 16 points in Iowa and New Hampshire, and by 14 points in Wisconsin). Meanwhile, Romney leads among men (by four points in Iowa, eight in Wisconsin, and 11 points in New Hampshire). What’s also helping Obama is early voting. In Iowa, according to the poll, 45 percent of respondents say they have already voted early or plan to do so, and Obama is winning those voters by nearly 30 points, 62 percent to 35 percent. But Romney is winning Iowa voters who plan to vote on Election Day by 20 points, 55 percent to 35 percent. New York is planning to put up tents that will act as polling places, but in the end the NBC's Chuck Todd says the burden of finding a place to vote remains with the voter. In Wisconsin, 25 percent say they have already voted or will do so before Election Day, and those voters are breaking to Obama by a 59 percent to 39 percent clip. And in New Hampshire, just 10 percent say they will be voting early, and Obama wins that small segment, 56 percent to 42 percent. 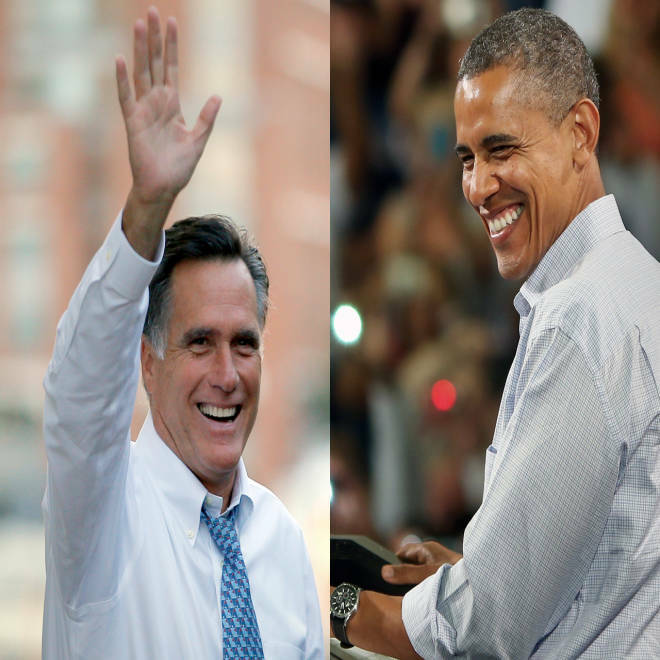 Among Election Day voters in the state, 48 percent back Romney and 47 percent support Obama. However, what has helped Romney close the gap in these three states has been his rising favorable ratings since September. The former Massachusetts governor’s favorable/unfavorable rating among likely voters in New Hampshire is 49 percent/46 percent – which is up from 43 percent/52 percent a month ago. His score in Wisconsin is 47 percent/47 percent, which is improved from 43 percent/46 percent in September. But in Iowa, Romney’s favorable/unfavorable rating remains upside down at 43 percent/49 percent. Also, Romney leads Obama by three points in New Hampshire on which candidate would do a better job handling the economy (49 percent to 46 percent). But the two men are tied on this question in Iowa (at 45 percent each) and in Wisconsin (47 percent apiece). • Obama’s job-approval rating among likely voters is at 49 percent in Wisconsin and 48 percent in New Hampshire and Iowa. • In Wisconsin’s competitive Senate contest, Democrat Tammy Baldwin gets the support of 48 percent of likely voters and Republican Tommy Thompson gets 47 percent. • And in New Hampshire’s race for governor, Democrat Maggie Hassan leads Republican Ovide Lamontagne by five points, 49 percent to 44 percent. The NBC/WSJ/Marist polls were conducted Oct. 28-29 of 1,142 likely voters in Iowa (which has a margin of error of plus-minus 2.9 percentage points), 1,013 likely voters in New Hampshire (plus-minus 3.1 percentage points) and 1,065 likely voters in Wisconsin (plus-minus 3.0 percentage points).